Writing is the most challenging subject in my class. My students DESPISE writing. I developed my own writing curriculum to help meet the needs and differentiate for all of my students varying abilities. 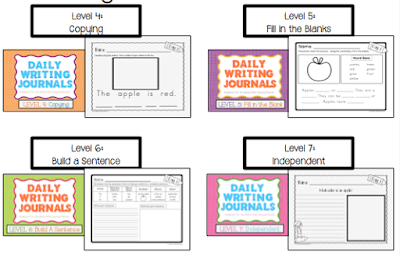 I have designed 7 different levels to target each child in your classroom.. I have created 180 days worth of instruction! 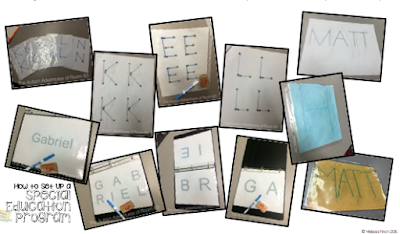 For all 180 days there are seven differentiated levels so that students can progress towards independence yet work as a class on the same subject at their OWN level! All writing takes place at the green center during the morning work centers. Here are the 7 different levels included in my Writing Curriculum Bundle. 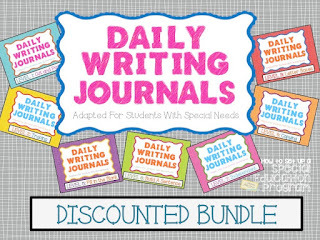 Each level includes 180 daily journal pages, 180 daily samples, anchor charts and grammar practice. When students first come to the green table they take their writing folder out, complete their work- and then do writing activities until it is time to rotate. I also stock my writing center with writing materials I have bought over the years. These are great to pull out to fill the time before we rotate to the next group. AND of course- sensory integration. The more fun- goo and mess we can make the better! As long as we are working on letter formation or spelling I allow it! Love these ideas! Thanks of sharing!